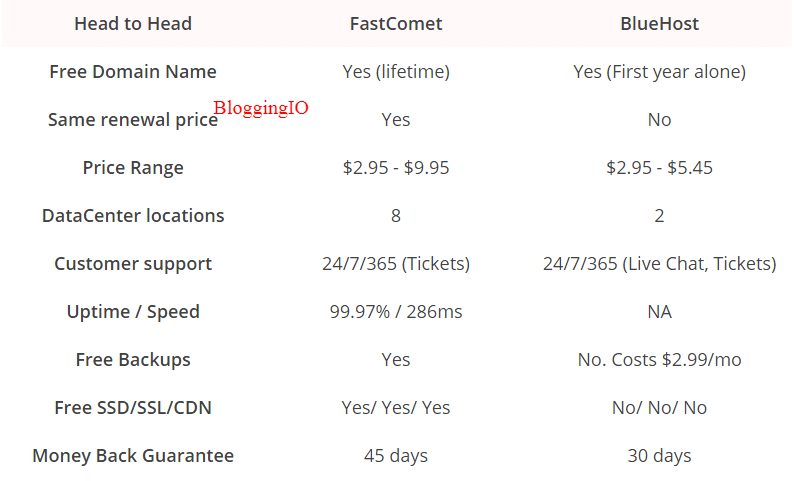 you really need to check out FastComet Review From BloggingIO, where I analyzed most thing about the company after using them for over forty months. 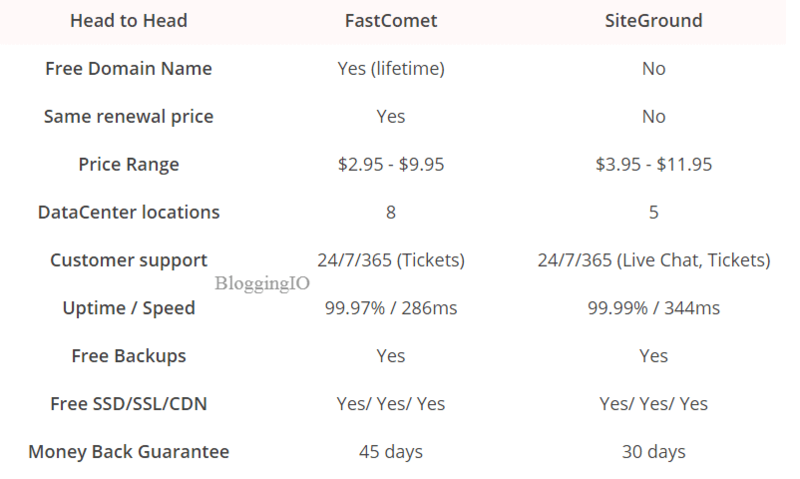 With the below table, you can straight away compare FastComet Vs your current hosting company. 1. Free Domain For Lifetime: No other hosting gives such an impressive deal considering domain registration like .COM itself cost $10 on an average. Till you host your sites with them, they will renew your domains for free every year. 2. Same Renewal Prices Forever: Have you heard this before a company gives same renewal prices for your life? I bet you can't. Join for $2.95/month and pay the same for lifetime. 3. Globalsign SSL: While most companies provide SSL from Let's Encrypt, the company offers you a premium Globalsign SSL for free on speedup plan. 4. Eight Data center locations: While most companies mentioned offers only hosting from US based data center locations, they're way ahead offering services from three US datacenter, three UK datacenter and two Asian datacenters. 5. Free Daily and Weekly Backups and restore: While most services upsells backups for additional charges, the company provides both backups and restore for absolute free of charge. 6. Free site transfer: While companies like Bluehost charges nearly $150 for site transfer from your existing host, the company does free human site transfer. 7. SpamExperts Powered Email: Many companies upsells SpamExperts service or offers only on higher plans, the company provides free SpamExperts for all plans. 8. In-house developed Caching mechanism for fast loading sites: If you check our review of FC, you can see the site loads under 200ms thanks to the five-layer caching mechanism. 9. BitNinja powered site security: BitNinja, the industry leader in securing WordPress sites was partnered with FC to offer seamless, secured WordPress sites for its customers. 10. Free Malware Removal: Companies like Bluehost charges an additional $1.99/month for malware protection, though I can see they charge even more additional bucks for malware removal. You don't have such headaches with FC Since they offer malware removal for all plans. 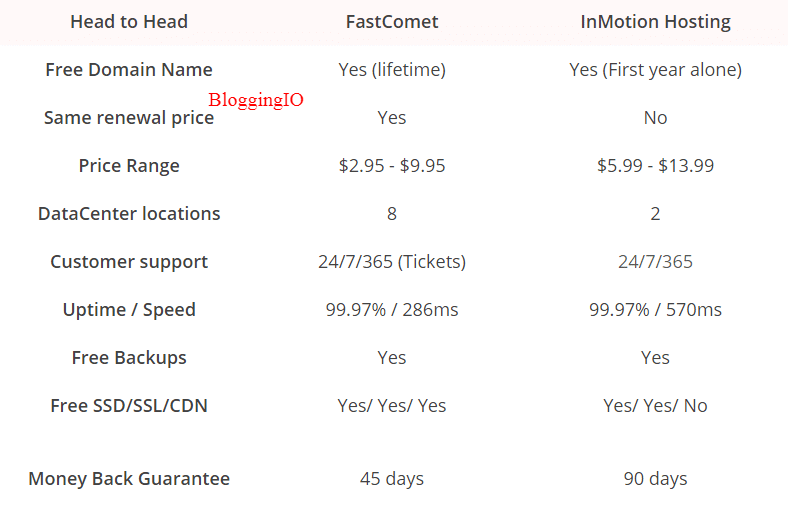 Here at Bloggingio, I wrote this post to post comparing with leading hosting providers based on the features, and performance. I mentioned FastComet as FC at some point in this post.Please follow up. Based on the popularity of companies here is our comparison post. If you're paying higher renewal charges for SiteGround, look no further choose FastComet. 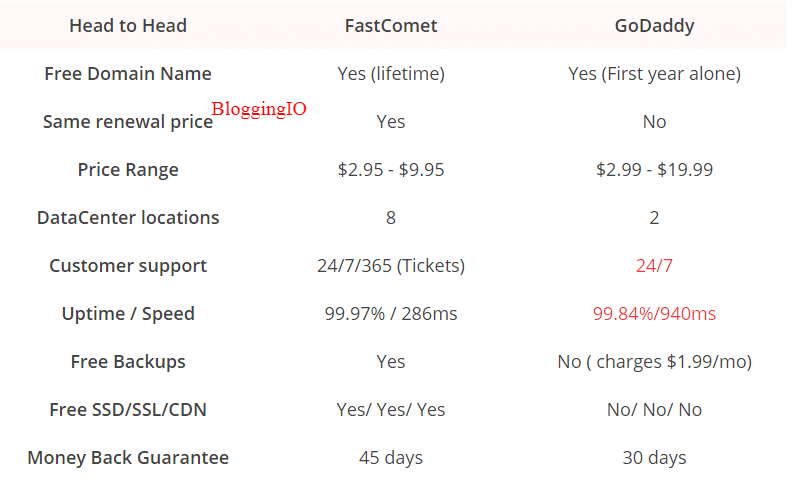 Both FastComet Vs SiteGround operate in a similar way but with same renewal price and free domain for lifetime, FastComet has an edge over SiteGround. Based on Hostingstep data, you can see there is no much difference between uptime and response time between these two, the only major difference is pricing. It is considered to be one of the greatest HostGator Alternatives in recent times. I started my blogging with HostGator back in 2013 but the performance, and operation of HostGator declined a lot in recent years, let's see who wins the race. 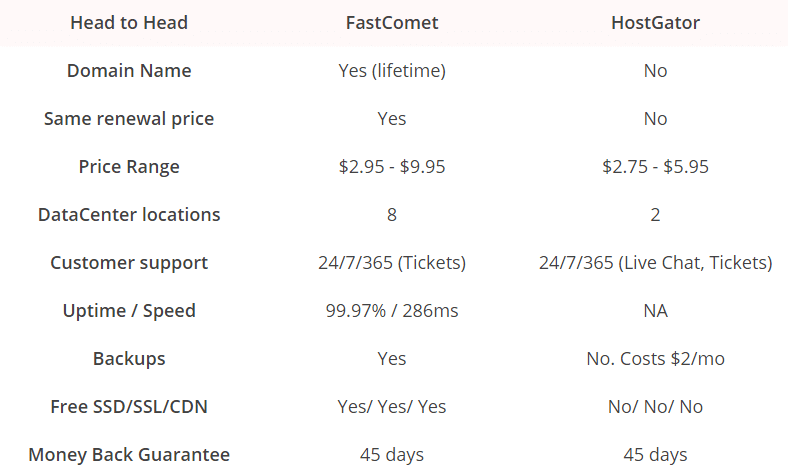 HostGator lacks a lot in many features like no free SSD/SSL/CDN options, backups costs additional $2/month and during non-production hours you need to wait for a longer period of time to get connected with support agents. Tired of Bluehost renewals and slow loading sites and someone recommended FastComet? It's generally a one sided comparison between Bluehost Vs FastComet since Bluehost excels only in offering high disk space. But when it comes to security, performance, pricing, support and features, FC scores good. You can simply close your eyes, get an account with FastComet with 45 days full money back guarantee, so you've nothing to lose. BlueHost and HostGator was owned by same brand EIG and it reflects the same in features, and pricing. P.S: Account cancellation with BlueHost is not easy, you need to call their US team and confirm to cancel your account and there is no free site transfer option with BlueHost. The major advantage of DreamHost over other companies is 97 days money back guarantee and but lacks in CDN, free backups and more over the pricing costs $7.95/month while FC plan costs $2.95/month. If you love DreamHost 97 days money back guarantee, you can choose it else if you're looking for domain, same renewal price, fast loading sites, FastComet is the best option to get started. Note: DreamHost doesn't come with cPanel. Godaddy "best for the domain, worst for Hosting" heard this quote a long time ago. Let's see which one rocks. Think about the condition of GoDaddy, they can't offer free SSL since the paid SSL is one of the income generating product for them. GoDaddy don't have an option to use CDN/SSD and charges additional for backups. Also from the reports, the uptime and speed is poor compared to most companies. 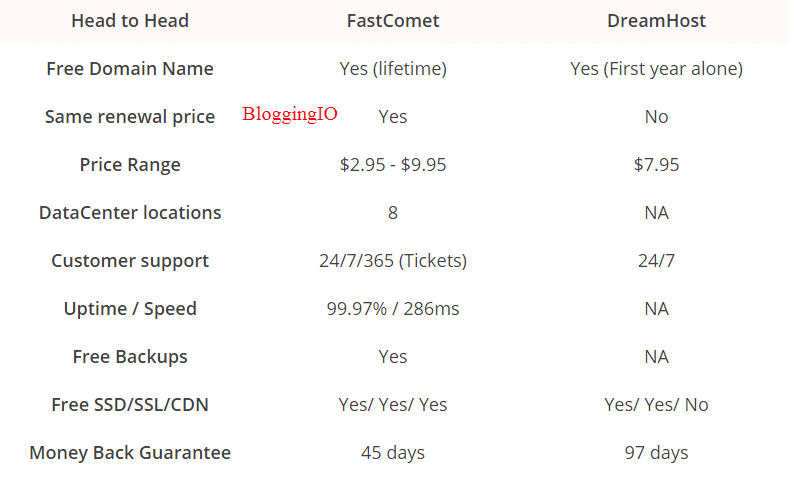 I think no explanation needed to compare FastComet vs GoDaddy, the above data explains you all. The two major companies A2 Hosting I love a lot. Let's see how they go head to head. 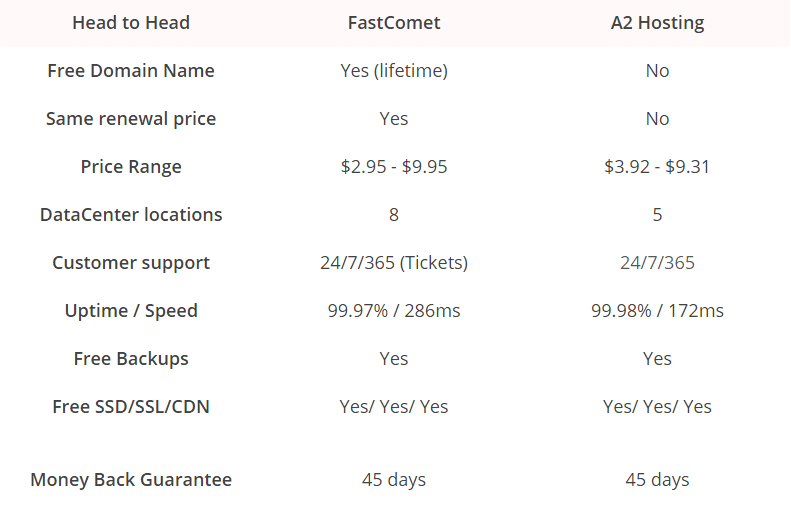 This will be one of the best comparisons FastComet Vs A2 Hosting. Both provide similar features and I found two major differences between them. A2 Hosting has an localized payment gateway for example, customers from India, Brazil etc can use their local bank cards to get an account with A2 Hosting and that's the sole reason, I put them on #1 spot in Best WordPress Hosting in India. On the other hand A2 Hosting don't offer domain and renewal charges are 3X while FC renewal charges are same. There are a lot more things to say, but it will be good only if you get an account from FC and test them from your end. Setup a server response time monitor when your sites are with Bluehost or others and then check your site response time when your site is completely moved to FC. I hope this FastComet Vs post cleared many of your thoughts and I'm planning to expand to expand the content with much more details in coming days. 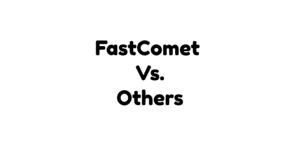 If you need a comparison of FastComet with a host that is not in the list, do let me know in comments. Undoubtedly FastComet is the best. I just bought a hosting plan via FastComet and it works best. While BlueHost tend to be most popular but it doesnt have features what one expect. FastComet has all what you want. It is not known to many people, but is a hidden treasure. i would rate fastcomet 10/10 in every aspect. the best thing is there support! which replies within 15 minits and resolves the problem in 20 minutes. Go for FastComet if you want a quality hosting. Buy Hosting from Mohan’s referral and have your website integrated by him! and i am very happy with his service. Still Not Convinced With FastComet? Host your websites at FastComet for free (14 days) and test their services. *This popup will disappear upon closing.